For other people named Gilbert Scott, see Gilbert Scott. Sir George Gilbert Scott RA (13 July 1811 – 27 March 1878), styled Sir Gilbert Scott, was a prolific English Gothic revival architect, chiefly associated with the design, building and renovation of churches and cathedrals, although he started his career as a leading designer of workhouses. Over 800 buildings were designed or altered by him. 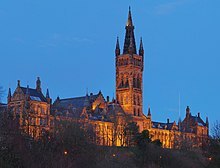 Scott was the architect of many iconic buildings, including the Midland Grand Hotel at St Pancras Station, the Albert Memorial, and the Foreign and Commonwealth Office, all in London, St Mary's Cathedral, Glasgow, the main building of the University of Glasgow, St Mary's Cathedral in Edinburgh and King's College London Chapel. Born in Gawcott, Buckingham, Buckinghamshire, Scott was the son of a cleric and grandson of the biblical commentator Thomas Scott. He studied architecture as a pupil of James Edmeston and, from 1832 to 1834, worked as an assistant to Henry Roberts. He also worked as an assistant for his friend, Sampson Kempthorne, who specialised in the design of workhouses, a field in which Scott was to begin his independent career. Scott's first work was built in 1833. It was a vicarage for his father, a clergyman, in the village of Wappenham, Northamptonshire. It replaced the previous vicarage occupied by other relatives of Scott. Scott went on to design several other buildings in the village. In about 1835, Scott took on William Bonython Moffatt as his assistant and later (1838–1845) as his partner. Over ten years or so, Scott and Moffatt designed more than forty workhouses,during the boom in building such institutions brought about by the Poor Law of 1834. In 1837 they built the Parish Church of St John in Wall, Staffordshire. At Reading, they built the prison (1841–42) in a picturesque, castellated style. Scott's first church, St Nicholas', was built at Lincoln, after winning a competition in 1838. With Moffat he built the Neo-Norman church of St Peter at Norbiton, Surrey (1841). Meanwhile, he was inspired by Augustus Pugin to participate in the Gothic revival. While still in partnership with Moffat. he designed the Martyrs' Memorial on St Giles', Oxford (1841), and St Giles' Church, Camberwell (1844), both of which helped establish his reputation within the movement. Commemorating three Protestants burnt during the reign of Queen Mary, the Martyrs' Memorial was intended as a rebuke to those very high church tendencies which had been instrumental in promoting the new authentic approach to Gothic architecture. St Giles', was in plan, with its long chancel, of the type advocated by the Ecclesiological Society: Charles Locke Eastlake said that "in the neighbourhood of London no church of its time was considered in purer style or more orthodox in its arrangement". It did, however, like many churches of the time, incorporate wooden galleries, not used in medieval churches and highly disapproved of by the high church ecclesiological movement. In 1844 he received the commission to rebuild the Nikolaikirche in Hamburg (completed 1863), following an international competition. Scott's design had originally been placed third in the competition, the winner being one in a Florentine inspired style by Gottfried Semper, but the decision was overturned by a faction who favoured a Gothic design. Scott's entry had been the only design in the Gothic style. In 1854 he remodelled the Camden Chapel in Camberwell, a project in which the critic John Ruskin took a close interest and made many suggestions. He added an apse, in a Byzantine style, integrating it to the existing plain structure by substituting a waggon roof for the existing flat ceiling. The choir stalls at Lancing College in Sussex, which Scott designed with Walter Tower, were among many examples of his work that incorporated green men. Later, Scott went beyond copying mediaeval English gothic for his Victorian Gothic or Gothic Revival buildings, and began to introduce features from other styles and European countries as evidenced in his Midland red-brick construction, the Midland Grand Hotel at London's St Pancras Station, from which approach Scott believed a new style might emerge. Scott advocated the use of Gothic architecture for secular buildings, rejecting what he called "the absurd supposition that Gothic architecture is exclusively and intrinsically ecclesiastical." He was the winner of a competition to design new buildings in Whitehall to house the Foreign Office and War Office. Before work began, however, the administration which had approved his plans went out of office. Palmerston, the new Prime Minister, objected to Scott's use of the Gothic, and the architect, after some resistance drew up new plans in a more acceptable style. Scott was awarded the RIBA's Royal Gold Medal in 1859. He was appointed an Honorary Liveryman of the Turners' Company and in 1872, he was knighted. He died in 1878 and is buried in Westminster Abbey. A London County Council blue plaque marks Scott's residence at the Admiral's House on Admiral's Walk in Hampstead. Scott married Caroline Oldrid of Boston in 1838. Two of his sons George Gilbert Scott, Jr. (founder of Watts & Company] in 1874) and John Oldrid Scott, and his grandson Giles Gilbert Scott, were also prominent architects. His third son, photographer, Albert Henry Scott (1844–65) died at the age of twenty-one. George Gilbert designed his funerary monument in St Peter's Church, Petersham. His fifth and youngest son was the botanist Dukinfield Henry Scott. He was also great-uncle of the architect Elisabeth Scott. Scott's success attracted a large number of pupils, many would go on to have successful careers of their own, not always as architects. In the following list, the year next to the pupil's name denotes their time in Scott's office, some of the more famous were: Hubert Austin (1868), Joseph Maltby Bignell (1859–78), George Frederick Bodley (1845–56), Charles Buckeridge (1856–57), Somers Clarke (1865), William Henry Crossland (dates uncertain), C. Hodgson Fowler (1856–60), Thomas Gardner (1856–61), Thomas Graham Jackson (1858–61), John T. Micklethwaite (1862–69), Benjamin Mountfort (1841–46), John Norton (1870–78), George Gilbert Scott, Jr. (1856–63), John Oldrid Scott (1858–78), J. J. Stevenson (1858–60), George Henry Stokes (1843–47), George Edmund Street (1844–49), William White (1845–47). Remarks on secular & domestic architecture, present & future. London: John Murray. 1857. A Plea for the Faithful Restoration of our Ancient Churches. Oxford: James Parker. 1859. Gleanings from Westminster Abbey / by George Gilbert Scott, with Appendices Supplying Further Particulars, and Completing the History of the Abbey Buildings, by W. Burges (2nd enlarged ed.). Oxford: John Henry and James Parker. 1863 . Personal and Professional Recollections. London: Sampson Low & Co. 1879. Lectures on the Rise and Development of Medieval Architecture. I. London: John Murray. 1879. Additionally he wrote over forty pamphlets and reports. As well as publishing articles, letters, lectures and reports in The Builder, The Ecclesiologist, The Building News, The British Architect, The Civil Engineer's and Architect's Journal, The Illustrated London News, The Times and Transactions of the Royal Institute of British Architects. 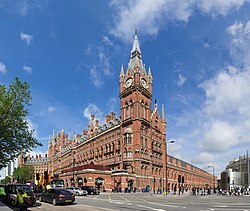 Although he is best known for his Gothic revival churches, Scott felt that the Midland Grand Hotel at St Pancras station was his most successful project. the Albert Memorial, London (1864–72); in the podium frieze, one of the images of architects, sculpted by John Birnie Philip shows Scott himself. the main building of the new campus of the University of Glasgow (1870), often called the "Gilbert Scott Building"
The Clarkson Memorial in Wisbech. Scott first put forward designs in 1875, but work did not start until 1880. The eventual design was a slightly altered version of Scott's original design. St Nikolai, Hamburg (1845–80), the tallest building in the world from 1874 to 1876. St Peter and St Paul, Priory Church Leominster, Herefordshire Quatrefoil piers (1872–79). St Michael, Stourport-on-Severn, Worcestershire designed (1875) started (1881) by son John Oldrid Scott, never finished and partly demolished. St Nicholas's, Newport, Lincoln, Lincolnshire. St Peter's Church, Elworth, Cheshire. Scott was involved in major restorations of medieval church architecture, all across England. St Peter and St Paul, Buckingham Church Buckingham, (1862–1878), additions to the original 1780 church including chancel, buttresses, porch, roof and nave alterations. Work continued over the years by his second son John Oldrid Scott and grandson Charles Marriott Oldrid Scott. Additionally Scott designed the Mason and Dixon monument in York Minster (1860), prepared plans for the restoration of Bristol Cathedral in 1859 and Norwich Cathedral in 1860 neither of which resulted in a commission, and designed a pulpit for Lincoln Cathedral in 1863. Scott restored the Inner Gateway (also known as the Abbey Gateway) of Reading Abbey in 1860 – 1861 after its partial collapse. St Mary's of Charity in Faversham, which was restored (and transformed, with an unusual spire and unexpected interior) by Scott in 1874, and Dundee Parish Church, and designed the chapels of Exeter College, Oxford, St John's College, Cambridge and King's College London. He also designed St Paul's Cathedral, Dundee. Lichfield Cathedral's ornate West Front was extensively renovated by Scott from 1855 to 1878. He restored the cathedral to the form he believed it took in the Middle Ages, working with original materials where possible and creating imitations when the originals were not available. It is recognised[who?] as some of his finest work. ^ Cole, 1980, p. 1. ^ "George Gilbert Scott (1811–1878) and William Bonython Moffatt (−1887)". The Workhouse. 23 April 2007. Archived from the original on 8 October 2007. Retrieved 29 April 2011. ^ "England: Northamptonshire". GilbertScott.org. Retrieved 20 January 2019. ^ The Workhouse Encyclopedia. Stroud, Glos: History P. 2014. Retrieved 20 January 2019. ^ "St Nicholas's, Newport – Lincoln". GilbertScott.org. Retrieved 20 January 2019. ^ Mallgrave, Harry Francis (2005). Modern Architectural Theory: A Historical Survey, 1673–1968. Cambridge University Press. ISBN 9780521793063. ^ Blanch, William Harnett (1875). Y parish of Camberwell. A brief account of the parish of Camberwell, its history and antiquities. G.W. Allen. ^ Cathedral, Restore Christchurch. "Restore Christchurch Cathedral - Cathedral Report Delivered to Government". restorechristchurchcathedral.co.nz. Retrieved 3 February 2018. ^ Hayman, Richard (April 2010). "Ballad of the Green Man". History Today. 60 (4). ^ "SCOTT, SIR GEORGE GILBERT (1811–1878)". English Heritage. Retrieved 9 January 2012. ^ "Sir George Gilbert Scott". Flickr. ^ Allinson, Kenneth (24 September 2008). Architects and Architecture of London. Routledge. p. 164. ISBN 9781136429644. ^ Historic England. "Tomb of Albert Henry Scott in the Churchyard of St Peter's Church (1380183)". National Heritage List for England. Retrieved 22 January 2016. ^ Higginbotham, Peter. "The Workhouse in Williton, Somerset". www.workhouses.org.uk. Retrieved 3 February 2018. ^ Sutton, James C, ed. (1999). Alsager the Place and its People. Alsager: Alsager History Research Group. p. not cited. ISBN 0-9536363-0-5. ^ "Cemetery Chapels, Ramsgate". www.britishlistedbuildings.co.uk. Retrieved 21 February 2014. ^ "Gate House to Cemetery About 50 Metres South of Cemetery Chapel, with Side Walls, Ramsgate". www.britishlistedbuildings.co.uk. Retrieved 21 February 2014. ^ "Vicarage, Jarrom Street". Flickr. ^ Reynolds, Susan, ed. (1962). A History of the County of Middlesex: Volume 3: Shepperton, Staines, Stanwell, Sunbury, Teddington, Heston and Isleworth, Twickenham, Cowley, Cranford, West Drayton, Greenford, Hanwell, Harefield and Harlington. Victoria County History. pp. 230–33. Retrieved 21 July 2007. ^ Bridges, Tim (2005). Churches of Worcestershire (2nd ed.). Logaston Press. p. 157. ISBN 1-904396-39-9. ^ "Sherbourne Park -". sherbournepark.com. ^ "Leicester St Andrew - Learn - FamilySearch.org". familysearch.org. ^ "A Church on Jarrom Street: St Andrew's ,Leicester". www.kairos-press.co.uk. Retrieved 3 February 2018. ^ Historic England. "Chapel At Wellington College With Porch Colonnade And Gateway Adjoining West End (1390357)". National Heritage List for England. Retrieved 24 April 2017. ^ Historic England. "Details from listed building database (1240546)". National Heritage List for England. Retrieved 23 March 2012. ^ Historic England. "Details from listed building database (1386145)". National Heritage List for England. Retrieved 3 September 2014. ^ "Lewisham, St Stephen with St Mark – East Lewisham Deanery – The Diocese of Southwark". anglican.org. Archived from the original on 13 May 2014. ^ "St Mary's Episcopal Cathedral Glasgow". Glasgow Architecture. Retrieved 31 August 2012. ^ Historic England. "Church of St. Mary the Virgin (32876)". Images of England. Retrieved 29 September 2007. ^ "Cemetery Chapels, Ramsgate". www.britishlistedbuildings.co.uk. Retrieved 15 April 2013. ^ "The Building - Description - St John's Church, Glastonbury". www.stjohns-glastonbury.org.uk. Retrieved 3 February 2018. ^ Clarke, John (1984). The Book of Buckingham. Buckingham: Barracuda Books. p. 145. ISBN 0-86023-072-4. ^ Historic England. "Church of St. Mary, causeway bridge, and gates (267143)". Images of England. Retrieved 20 November 2007. ^ Tyack, Bradley and Pevsner, Geoffrey, Simon and Nikolaus (2010). The Buildings of England: Berkshire. New Haven and London: Yale University Press. p. 443. ISBN 978-0-300-12662-4. Bayley, Stephen (1983). The Albert Memorial (paperback ed.). London: Scolar Press. Cole, David (1980). The Work of Gilbert Scott. London: Architectural Press. ISBN 0-85139-723-9. Eastlake, Charles Locke (1872). A History of the Gothic Revival. London: Longmans, Green & Co.
Hitchcock, Henry-Russell (1977). Architecture:Nineteenth and Twentieth Centuries. The Pelican History of Art. Harmonsworth: Penguin Books. Pevsner, Nikolaus (1963). Herefordshire. The Buildings of England. Harmondsworth: Penguin Books. ISBN 0-14-071025-6. Pevsner, Nikolaus (1968). Worcestershire. The Buildings of England. Harmondsworth: Penguin Books. Sherwood, Jennifer; Pevsner, Nikolaus (1974). Oxfordshire. The Buildings of England. Harmondsworth: Penguin Books. ISBN 0-14-071045-0. Wikimedia Commons has media related to George Gilbert Scott. Wikisource has the text of the 1911 Encyclopædia Britannica article Scott, Sir George Gilbert. "Scott, George Gilbert" . Dictionary of National Biography. London: Smith, Elder & Co. 1885–1900. "Sir George Gilbert Scott". Metalwork. Victoria and Albert Museum. Archived from the original on 21 June 2008. Retrieved 18 August 2007. "George Gilbert Scott's workhouse designs". The Workhouse. The Workhouse. Retrieved 9 September 2008.